Above all, this great King was a scholarly devotee too but at the same time had behaved like an ordinary man and had placed before God an unreasonable desire.. And it is this unreasonable desire that forms the crux of this whole story.. Although this meaningless desire in the great King’s life led to an irreparable tragedy, it however had resulted in heralding the divine entry of Lord Sri Venkateswara into our human world..
Everyone in this great King’s kingdom was happy with the King’s administrative capabilities and every member of the King’s family and every employee in his palace too were extremely happy with the King’s good and kindhearted nature. With a good rainfall on time year and also a good cultivation all around his kingdom, the King was a happy man both in his family affairs and also in his kingly affairs.. The King has a lovely daughter too who was the cynosure of all the eyes of the King’s vast kingdom.. With so many good things happening in his life and with so many happy faces all around him, the King neither had any complaint to make in his life nor had any issue to worry about. When the great King’s wisdom shied away from him.. When all the enlightened philosophy, he had learned in his life, faded away from him.. When all the Dharma Sastras and Dharma Sutras he had preached and practiced in his life have temporarily deserted him. During such ill fated moments of life, an unreasonable desire entered the noble King’s mind which had led to an unimaginable degree of a series of tragedies in his life.. And here’s that unreasonable desire which the great King had placed before the God on that darkest day of his life..
“..O’ God.. From hereafter, I should lead my entire life just this way with only happiness and happiness alone.. O’ God.. Please don’t give me any sort of unhappiness nor any sort of unpleasant experience in my life. How unfair a desire to place before God and how unrealistic was it for God to consider..?? The great King, as said earlier, was a great philosopher too and knows pretty well that.. But unfortunately, the King had placed before God a meaningless desire to grant him a life full of only happiness and not any unhappiness..
An ordinary man may request God to grant such a boon but not a great Gnani like this King who knows pretty well that no human being in the history of humanity was ever granted such a boon.. The King’s younger brother, who was until then handling all the responsibilities related to the kingdom, had died in extremely tragic circumstances.. Unable to bear with the trauma of separation from her beloved husband, the King’s brother’s wife too died in just a few weeks of time. This king’s brother has three lovely daughters and with the loss of both their parents in a short gap had brought endless sorrow to the King.. For a noble man who had not seen any such tragedy in his past, this tragedy was a huge one to handle for the king..
Additionally, he is burdened with the responsibility of not only bringing up his brother’s daughters but also of performing their marriages as well.. This of course was in addition to the king’s own daughter’s marriage. The king now has enough reasons to worry about in life, due to which reason he was unable to focus on the administrative matters of his kingdom. ” O’ God.. Please forgive me for all the sins I may have knowingly or unknowingly committed in this life.. O’ God am now seeing a tragedy that’s giving me a suffering enough for many more lives to come.. O’ God my only worry now is about my daughters.. But the King again knows pretty well that he’s asking God a bit too much and also knows that his wishes may never come true. This thought gave the King more sorrow and made him more restless.. But the poor King, at that point of time, was unaware that his wishes are actually going to come true just exactly the way he was wishing them to come true.. But those were the divine moments the King was not aware of and during those divine moments..
A great Maha Rishi (Maharshi or Holy Sage), as though instructed by God, had walked into the King’s palace.. This Maharshi was also the crucial adviser and Spiritual Guru of the King whom the King often relies upon for many of his administrative issues.. Although the sudden arrival of the Mahrshi surprised the King it however gave him immense relief from his endless sorrow.. The King then shared all his woes with the Maharshi.. The Maharshi smiled and said..
“Hey Raja.. Every problem in Nature has a solution, every pain has a relief and every sorrow an ending.. Nothing lasts forever not even your troubles.. There’s a poetic justice in every deed of God and Nature always works in accordance with that.. Am surprised a Maha Gnani like you doesn’t even know this important cosmic theory..”..
“Lord Vishnu is going to take the form of Lord Venkateswara in Kali Yuga to protect His devotees from the sins of this most dangerous Yuga.. He would be residing on the Venkatadri hills till the end of the 28th Kali Yuga.. This form of Lord Vishnu is also going to be the strongest and the most powerful of all His incarnations.. 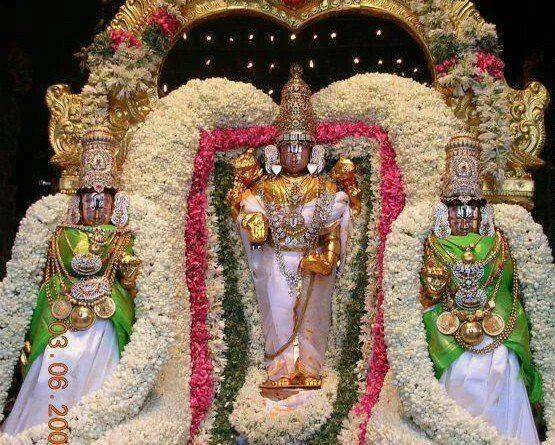 Anyone who listens to the story of this Holy Lord Venkateswara would find an immediate solution to all their problems. This story of Lord Sri Venkateswara has the power to heal incurable diseases; solve financial problems; get the unmarried married; lend harmony to marital life; regain lost property and offer children to the childless couple. There’s no problem in this universe that cannot be solved by listening to this story.. Even in the Deva Loka (Celestial World) many angels, including Lord Brahma and Lord Indra, have listened to Lord Venkateswara’s story whenever they thought they have an unsolvable problem in front of them. Saying so, the Maharshi during those Golden, historic and divine moments had started revealing the story of Lord Sri Venkateswara to the great King.. Firstly, the Maharshi began his story with the description of the seven hills and later narrated the complete story of the holy Lord to the King. Listening to that holy story of Lord Sri Venkateswara made the King immensely happy.. With his eyes full of tears he at the end of the story had prostrated before the holy feet of the great Maharshi and took his blessings. This narration by the great Maharshi to the great King became the first historic narration of the story of Lord Sri Venkateswara on the human world.. And it is also through this narration that we all came to know about the holy Lord and His glory..
After listening to this sacred story, all the problems of the King have vanished and all his four daughters, as was desired by the King, have been married to four great warrior brothers belonging to a great kingdom. Most of you must have by now guessed who that great King was but let me now tell you that the great King was none other than Seeradhwaj Janaka, more popularly known as Raja Janaka or King Janaka, the powerful King of Videha. Let me also tell you that Janaka (means King or ruler) is only a title and not a name.. Seeradhwaj Janaka was the twenty second king of Videha.. Raja Janaka’s beloved daughter, as you all may be knowing, was Goddess Sita who was later married to Lord Rama in a Swayamvar. Subsequently, Sita’s sisters (cousins) Urmila, Sritha Keerthi and Mandavi have married Lord Rama’s own brothers Lakshmana, Satrughna and Bharatha respectively. The entire tragedy that occurred in the life of King Janaka was experienced by the King only in his dream and not in reality.. The King, in his dream had actually seen his brother and his wife surrendering to death and had also seen their daughters weeping, heart broken. Disturbed by the dream, King Janaka woke up immediately and after that day for many days could not sleep properly until the day the Maharshi had come to his palace.. Dreams in those days were considered as coming events casting their shadows hence the King Janaka was full of sorrow and worried about his daughters. On the other hand, the Maharshi in the above story – who was Sage Satananda, son of Sage Gautama and Ahalya – with his divine powers could simultaneously see the dream of his disciple Janaka. Satananda explored further with his divine powers and was shocked to find that the King Janaka had not just seen the dream but had actually seen his future and this dream tragedy is about to come true at the earliest in King Janaka’s life. The Maharshi could finally realize that the time had now come for Janaka to listen to the story of Lord Sri Venkateswara without which it would be impossible for him (Maharshi) to thwart away that forthcoming doom in Janaka’s life. Sage Satananda was also aware that the King Janaka is a great yogi by himself and he too must have by then certainly realized that the tragedy, he had seen in his dream, may come true at any moment. Maharshi Satananda could also further see the future of Janaka and have again realized that unless Janaka listens to the story of Lord Sri Venkateswara he cannot gain the good fortune of having Lord Rama as his son in law and unless Lord Rama becomes the son in law of Janaka, his mother (Satananda’s mother) Ahalya cannot be exonerated from the curse imposed upon her by her husband Sage Gautama. With so many divine responsibilities to handle and with so many cosmic schemes to be executed, the holy Maharshi Satananda without wasting a moment had rushed straight to King Janaka’s palace..
Now please tell me.. Because King Janaka had to listen to the story of Lord Sri Venkateswara he had that dream..??.. Or is there any other reason..??.. But WHO gave King Janaka that dream..??.. And Who had shown Sage Satananda the future of King Janaka..? ?..